A second round of dialogue between World Council of Churches (WCC) members and Pentecostals was inaugurated last week in Baar, Switzerland. 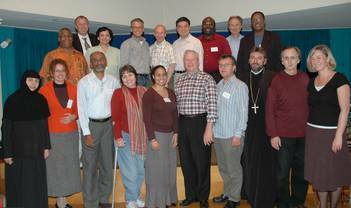 A group of seventeen Protestant, Orthodox and Pentecostal Christians met to re-launch the work begun by the first Joint Consultative Group between the WCC and Pentecostals from 2000 to 2005. In reflecting on the importance of this meeting, Cecil M. Robeck Jr., professor of church history and ecumenics at Fuller Theological Seminary, who returns as the Pentecostal co-moderator of the group, said “this meeting has given us a very good start on the next five years of our work together”. Jennifer S. Leath, African Methodist Episcopal Church (USA), who serves as the WCC co-moderator of the group, said she hopes that it will “continue to grow in mutual understanding and will not shy away from difficult questions or challenges for unity”. After several years of dialogue with Pentecostals from around the world, the first Joint Consultative Group between the WCC and Pentecostals was established by the Harare Assembly in 1998. The report of the first group was received in 2006 by the Porto Alegre Assembly, which recommended its continuation as an important platform for developing deeper understanding and opportunities for dialogue. Some of the members of the first group were re-confirmed by their churches to serve again, helping to ensure a measure of continuity in the conversation. The meeting in Baar began and ended each day with prayer and Bible readings according to different church traditions. In depth Bible studies were held each morning. Participants shared personal testimonies of faith and the stories of their churches. The group also took time to reconstruct the story of the dialogue that developed between 2000 and 2005. They also set an agenda for their work in the years to come. Veli-Matti Kärkkäinen, Finnish Pentecostal Mission, presented an overview of Pentecostal bilateral dialogues with the Roman Catholic Church, the World Alliance of Reformed Churches and conversations with the Lutheran World Federation. He stressed how this work has “laid the foundation for continuing Pentecostal involvement in the struggle for the unity of the Church of Christ”. Harold D. Hunter, IPHC Ministries, led a conversation on the “ecclesial gift of charisms”. Marina Kolovopoulou, Church of Greece, and Cephas Omenyo, Presbyterian Church of Ghana, led a conversation on the “ecclesial gift of sacraments”. Both topics had been recommended for further discussion by the first group. The group set for its agenda continued theological dialogue on the nature of the church, beginning in 2008 with a study of the marks of the church – Oneness, Holiness, Catholicity and Apostolicity. As the conversation progresses, the group will continue in 2009 with discussion on the nature of mission. In Baar, the group was hosted at the Focolare Centre and enjoyed an evening of fellowship and culture with the community there. Group members worshipped with local Reformed, Free Evangelical and Syrian Orthodox churches. The group will meet again in October 2008.